Although the early period of the summer season threw people for a loop, with many of the "sure things" falling through, and several films catching people by surprise, the later summer has tended back towards predictability. Now we have one of the last "big things" of summer, as sure a license to print money as anything, to start us on the home stretch of the season. 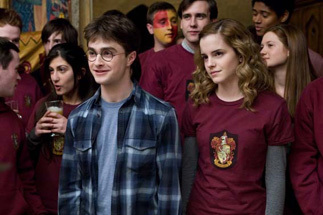 Harry Potter and the Half-Blood Prince is the sixth film of the now-planned eight film Harry Potter series. The formula of these should be intimately familiar to all by now, but just in case you've been living under a rock all these years (and if you have, I have some bad news about Michael Jackson, too) – the films center around aspiring wizard Harry Potter in magical boarding school. Marked as The Boy Who Lived after surviving an attack by the series' embodiment of evil, Voldemort, he constantly finds himself in the middle of conspiracies that threaten the existence of the school. In Half-Blood Prince, Harry finds a mysterious book filled with magical notation that seems to hold the key to defeating Voldemort once and for all. While dark conspiracies surround Harry and his friends, it's also time for this series to meet the CW network, as young love blossoms between several of the main characters. If that's not enough, it's also one of the more action packed entries in the series, as Voldemort's minions start to show their faces to do battle with Professor Dumbledore and the side of good. In other words, in this one, things get real. And as critic-proof as the Potter films largely are, this one has received some of the best reviews of the series. Five films in, the Potter series has shown a remarkable consistency, with a domestic box office range of $250 to $317 million, and $800 million to $1 billion in worldwide box office per film. In short, it's been a juggernaut since the beginning with no sign of slowing down. 2007's Order of the Phoenix actually had the lowest three-day weekend figure of $77 million, though that was in part due to a Wednesday release pattern that also yielded the highest single day total for a Potter film yet, of $44 million. Releasing in 4,275 venues, it's got an extremely good chance of busting the five-day figure that Phoenix put up of $139 million. With extensive first day screenings, an over $45 million Wednesday is likely, and the film should see over $145 million over five days, about $80 million of which coming from Friday to Sunday.